Welcome to Stop 40 the Consequences Audio Tour! If you’re in a hurry to listen to Chapter 40: MUSE, run to SIP READ LOVE RIGHT NOW! Me: Run run to SIP READ LOVE to find out! 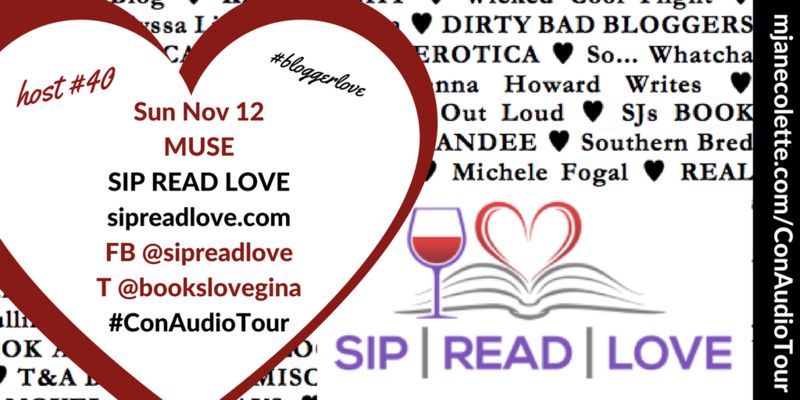 All the action today, as throughout the tour, is on the day’s blog host’s blog–but if you’ve got a few minutes to spare, let me introduce you to SIP READ LOVE! She was also at RT17, now as an official book blogger. So—I wasn’t at RT16, and Gina and I DIDN’T meet at RT17—that amazing Disneyland for romance writers and readers I’ve told you about elsewhere. But we kept on seeing each other’s posts and commenting on them on the RT app during the conference, and we followed each other on Twitter, and I checked out her blog (and you should too—especially if you’re a fan of Sylvia Day, Shayla Black, Sabrina Jeffries, Tara Sue Me, Kathleen Givens, Anne Marie Walker, Amy K. Rogers, and Diana Gabaldon, who are among her favourite authors), and… then there was tweeting and retweeting and what-not, and one tweet led to another, and so of course when I started planning the Consequences Audio Tour, Sip Read Love was one of the first bloggers I invited to be part of it. I am so very very grateful Gina and Sip Read Love accepted my invitation to be part of the Consequences Audio Tour, and I hope her readers enjoy the MUSE chapter, which is so outrageously hot, I think Sylvia Day would be proud. Thank you, Sip Read Love​ / Gina !